Billboa has some amazing buildings, most of them built in the last 30 years. It also has some pointless ones. Here is a quick history lesson. Back in the 1990’s the Basque government managed to persuade the Guggenheim foundation to build a new museum in Bilbao on some reclaimed industrial waste land and since then Bilbao has undergone a gentrification so quickly and widespread that it makes what has happened in London and Manchester look possibly tardy. New buildings, a metro, trams, you name it, Bilbao has got it, all since the arrival of the Guggenheim (more of which later). One thing that downtown Bilboa hasn’t got a lot of are skyscrapers. There are few tallish buildings dating from the 1960’s, but only one new standout building built in the last 10 years. The Iberdola Tower was completed in 2012 and is 40 stories tall and stand at 165 meters. It looks good and can be seen from most places in the city, but it has one fundamental problem. It’s overlooked. People build tall building for a few reasons; to save space but mainly as a status symbol so that they can look down on the rest of the city and charge people to travel to the top of your lovely tower to get a unique vista of the city. 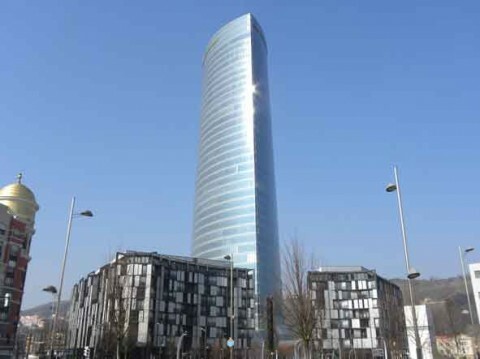 So how can the tallest building in Basque Country be overlooked? Well Bilboa is built in very steep valley and they have pretty much completely built up the sides of they valley but not with little houses, but with 13 storey blocks of flats. The outskirts of Bilboa looks more like Hong Kong as they have built tall and they have built densely. In fact when we were coming down the funicular the other day I spotted an old lady hanging over the balcony of her 10th storey apartment, admiring the view and looking down the Iberdola Tower. It’s hard to be the tallest building in the region when 70% of the population of the city have a better view from their bed room window than you do. Oh and apparently there was some corruption scandal when it was being built as well. The Guggenheim is another fascinating building. It looks stunning. I facetiously commented that it looked like a more wavey version of the Lowrey in Salford, and it would appear that comparisons have been made about their design and their effect on regenerating former post-industrial wastelands. The Guggenheim really has come to represent Bilboa the same way as the Eiffel Tower has Paris and the London Eye…errr…London. The problem is what is on the inside. Gentlemen over hearing the conversation “Well it would be less painful than going in the rooms and looking at the sh*t on display”. Cue general guffawing and agreement all round. Oh and apparently there was some corruption scandal when it was being built as well. The final amazing structure is the new home of Athletico Bilbao, the “new” Sans Mames stadium. The old stadium had a capacity of 40,000 so quite small for a team in La Liga (the Spanish Premier League) and they wanted to build a new stadium which could hold over 53,000. Instead of moving the ground to a totally new location they did what Spurs are currently doing and built half the stadium next to their existing stadium. In Spurs case they have had to move to Wembley for a season until they have finished building, but Bilboa just moved into a half built stadium, knocked the old one down and the finished the stadium off. This has left them with a stunning news stadium in the same location as the old one. A win win situation. The only thing is that the largest crowd that they have ever had so far is 49,000 for a game across Real Madrid. So there are 4,000 seats that are yet to feel the warm buttocks of football supporters. I think they may have over estimated their support there. Oh and apparently there was some corruption scandal when it was being built as well. Saying all this, I have to admire the city. It has gone from a down on its luck industrial relic, to the cultural centre of Northern Spain. And the capital of corruption scandals as well, but you can’t have everything can you?